As if dating wasn't a challenge in itself, add in a newly divorced man and you may feel unsure how to handle this potentially dramatic relationship. As of 2009 there were more than 1 million divorced men in the U.S., according to the Census Bureau. If your guy is newly divorced, understanding how to handle his situation can help to prevent problems. Couple on a date eating salad and drinking wine. Before throwing yourself into a relationship with a newly divorced man, make sure that you aren't his rebound. 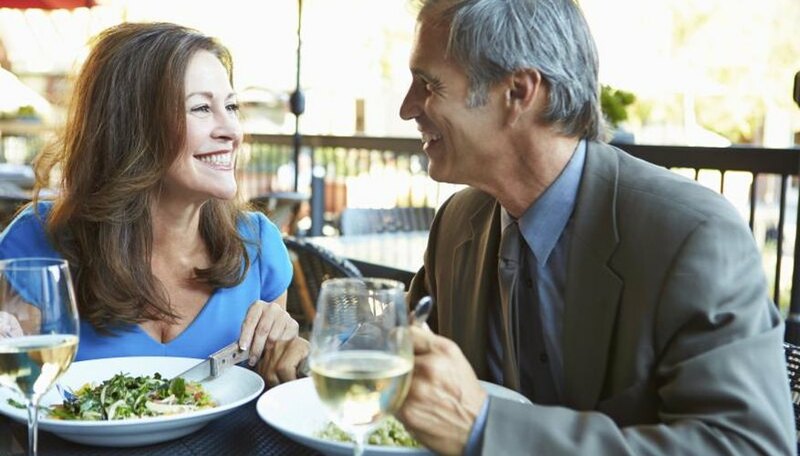 Relationships that start as a rebound after divorce may end in failure more easily than those that don't, according to psychiatrist Mark Banschick on on the Psychology Today website. Red flags that signal a man on the rebound are often constant talk about his ex, depression and getting serious with you too soon for no real reason. Give him the time that he needs to feel ready to date again. Instead of being with you out of true interest or desire, he may just want someone -- not you in particular -- to keep him company or replace his ex. If your divorced beau has kids, taking his children into consideration is a must. Being in the "just dating" stage -- or a not-so-serious relationship -- likely means that he won't introduce you to his children. Don't take offense or think that he doesn't ever want to get serious with you. If and when he does introduce you to the kids, they may take some time to warm up to you or have concerns that you are trying to replace their mother. Take it slow and get to know them gradually. If the children don't behave around you, it's possible that they are having a rough day. That said, if they're disrespectful all of the time -- or to their dad -- it's a possible sign of trouble, according to psychologist Christie Hartman in her article "5 Things To Consider When Dating a Single Dad." Understanding why the man divorced is a must if you think that your relationship may go from casually dating to serious. Don't stop at asking him why his marriage failed. Ask what he learned from the relationship and what he wants in the future from a potential partner, suggests psychiatrist Gail Saltz in the "Chicago Tribune" article "Dating In An Age of Multiple Divorces." Although you should make yourself available for him to talk to, don't try to play the role of therapist. If he's not coping well with the situation, suggest that he seek professional help to deal with the emotions and come to a better understanding of what went wrong in his past marriage. Divorce is a major life change that may affect many areas. Your man's financial situation, schedule and possibly even place of residence may change following the divorce. He may need to adjust to only seeing his children every other weekend or he may need to find a new place to live if his ex got the house in the settlement. Show understanding when it comes to his lifestyle changes. This may mean showing flexibility when he needs to handle a new situation. For example, instead of expecting that he'll take you out every Saturday night, understand that some weekends are only for his kids. Loop, Erica. "How to Date a Newly Divorced Man." Dating Tips - Match.com, https://datingtips.match.com/date-newly-divorced-man-7672756.html. Accessed 22 April 2019.